The topiary bear, that I’ve grown from a Conical Yew, seen on my front lawn, here at Whimsey Hill House. 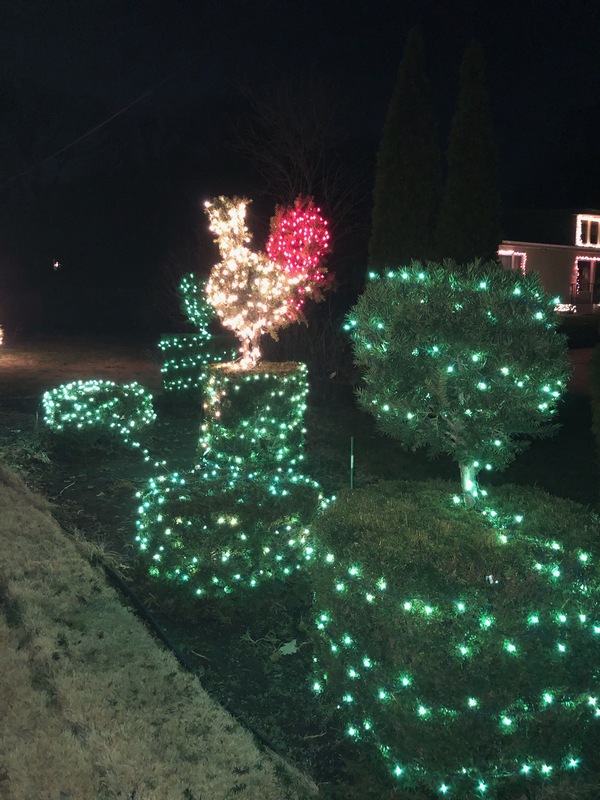 A topiary chicken, flanked by a pair of upright yews with lollipop tops, lit for the Christmas period, here at Whimsey Hill House. Wishing You and Yours health, wealth and happiness during the Christmas period and in the New Year. If you’ve wondered where I’ve been, well, I’ve been busy with my garden and have had workmen here sprucing up the house a bit, and one new project leads to another. Like, when I had a new sidewalk poured, the project for me that followed, was to then regrade and landscape the area that was torn up during the sidewalk construction. Or after they installed a few new windows and cut through the old sheet-rock, leaving dust, dirt and debris, that even after being swept and vacuumed up, still gave me the chore of washing my hardwood floors, throughout the whole house, on my hands and knees with Murphy’s Oil Soap. You get the picture. It’s not just about paying for something and you’re done. It’s about cleaning up the mess the workmen leave, no matter how good of a job they do. If you want to take a look at what I might be doing, here and there, when I’m not doing chores, look at the new Instagram that I’ve started https://www.instagram.com/fredgonsowski/?hl=en . I wanted to start it because I could show you a part of my life that I can’t show in a blog post. It’s kind of quick to do, and with it I can show you images of things that I like, seem to attract me, or even photos of myself. 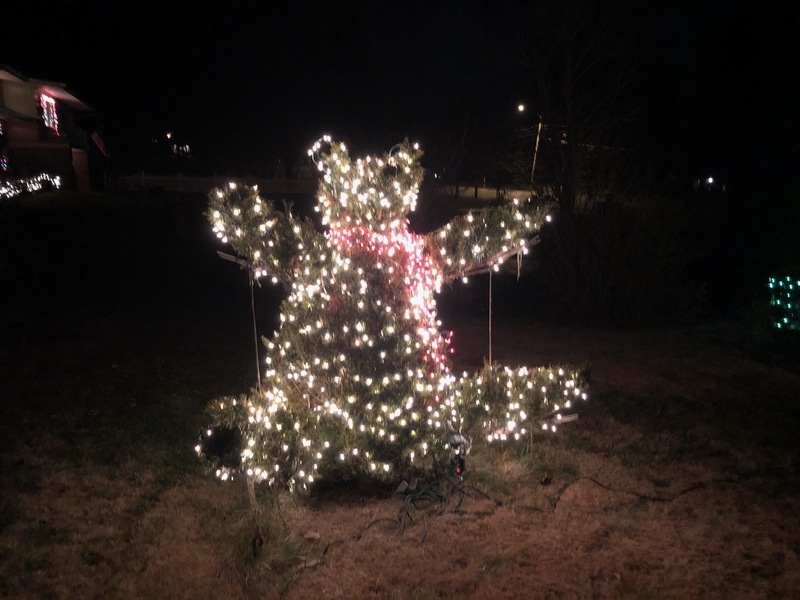 The two photos that make up the cover pictures for this blog article, are of the topiary bear and chicken that are here at Whimsey Hill House on my front lawn, that I’ve lit for Christmas. I do hope, that when things settle down for me, I will again have time to write posts that hopefully will inspire. Until then, Wishing you the Best in 2019! This entry was posted in CHRISTMAS / Easter. Bookmark the permalink. Christmas to you! And thank you for taking the time to post this year. It’s giving me and I’m sure so many others so much enjoyment and information! Looking forward to seeing what you do in the new year. I’ll take a look at your Instagram. I don’t follow but sometimes I can view them. T.
Merry Christmas to you, Fred! Hold your memories close and they will warm your heart. Thanks for sharing the Instagram link, it’s like a big postcard from you! Wishing you all the best in 2019! Oh my goodness I cannot believe how beautiful that Coaching Weekend in the Berkshires was! You certainly find the most interesting adventures Fred! And your lighted topiaries are so fun too. It’s always such a pleasure to read your blog and see so many wonderful surprises. I don’t belong to Instagram but was able to see your photos, so nice! Wishing you and yours a very Happy, Healthy and Whimsical New Year! Christmas is long gone, but I’m glad to hear you’ve been occupied and well. Thanks for this blog – any new posts you feel like putting up will be well worth the wait, and I’ll be sure to check in on your new instagram. Best wishes for a healthy, happy 2019.